We have a new paper together with Teiko Heinosaari and Maria Anastasia Jivulescu: Random positive operator valued measures. We introduce and analyze different models of random quantum measurements (POVMs). We prove that two very natural procedures for generating random POVMs are actually identical and then we analyze in detail the spectral properties of this model. We discuss at length whether two independent POVMs sampled from an ensemble are compatible or not. Quantum measurements (mathematically modeled by POVMs) are a bunch of positive semidefinite operators which sum up to the identity: , where and . It is always useful to think of quantum theory as a non-commutative generalization of classical probability theory. In this situation, one can understand POVMs as matricial versions of probability vectors: both are objects having some positivity property and a normalization constraint (elements sum up to ). How to define a natural probability measure on the set of POVMs? Let us try and get some inspiration from the classical case, that is probability vectors. 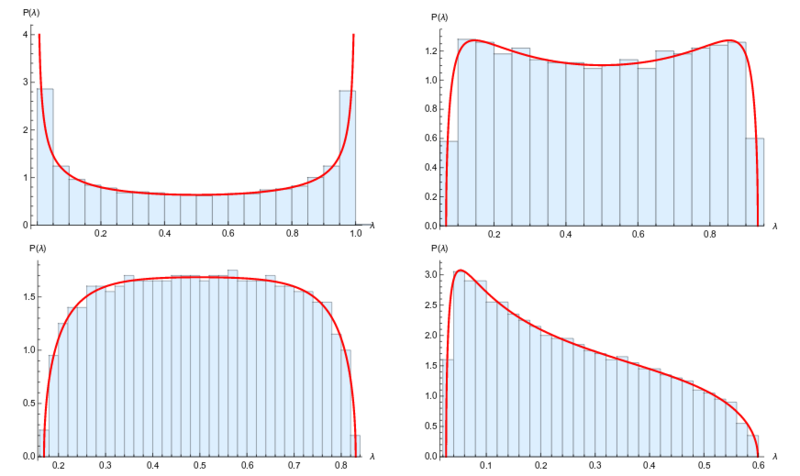 There exist distinguished measures on the probability simplex, the Dirichlet distributions. The resulting vector will have a Dirichlet distribution of parameter . We follow the same strategy in our setting: we shall sample independent multivariate Gamma random variables (also known as Wishart matrices) and normalize them in a proper way. The is there because the real and imaginary parts of a standard complex Gaussian random variable are independent real centered Gaussians, of variance . From such a random Ginibre matrix , one produces a Wishart matrix by setting . The result is a random positive semidefinite matrix, of typical rank . We have thus obtained a random POVM: the operators are still positive semidefinite, and they sum up to the identity. %   random matrix, normalized by the sum. In the paper, we actually use a different method to produce such random measurements, which is based on Haar-distributed random unitary matrices, and which more pleasant to work with analytically. Proving that these two methods are equivalent is one of our main results. Having defined random POVMs, we then study their properties. We start with the spectrum of individual effect operators . The behavior of their eigenvalues, in the large limit, is given by Voiculescu's free probability theory. We also study the probability that two random POVMs and are compatible: is there another POVM with elements such that the marginals of are and ? This question can be decided for concrete examples using semidefinite programming. However, in practice, when the size of the matrices becomes large, this technique can be computationally expensive. We then resort to compatibility and incompatibility criteria, which are simpler conditions that are only sufficient or only necessary for compatibility to hold (the situation is similar to the one in entanglement theory). We compare such compatibility criteria for generic POVMs, and we declare a winner! I will let you read the paper to find out which one that is. For incompatibility, the situation is more complicated: the known incompatibility criteria are very weak for random POVMs of large dimension with few outcomes. It is an open problem to invent new such criteria which can be insightful in this asymptotic regime.